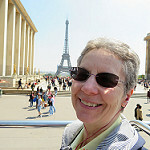 WOW You have been busy seeing all of the great sights in France and walking !! Glad you are feeling better, Phil, and sorry your friend, Bill, couldn’t have traveled with you. I’ll be leaving for Finland on the 18th, but will continue to enjoy your blogs. Keep sending them.